The latest marketing philosophy, Influencer Marketing is a strategy that relies primarily on entering into a partnership or sponsorship with key individuals who have a large online following, audience and have the ability to influence a large portion of your target market, or alternatively allow you to branch out into another target market. 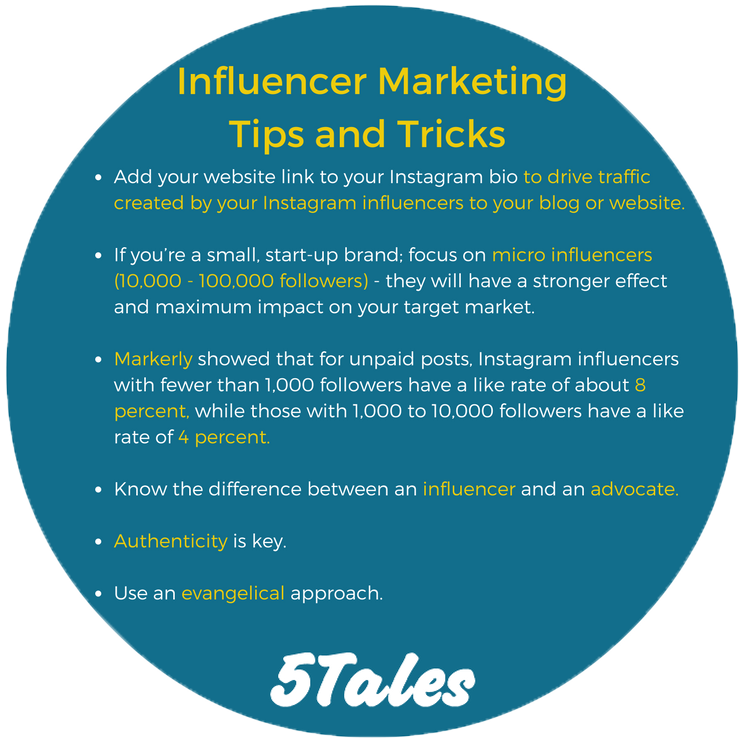 The goal of the influencer is to “Spread the message for you.” People trust influencers, perhaps even more than their family and friends when it comes to these niche topics. We spend hours per day listening, watching and consuming what these people have to say and usually, so so on a number of different platforms. Influencer marketing research shows that a 5:1 return on investment is not unusual if your message is spread for you by a sponsored influencer. 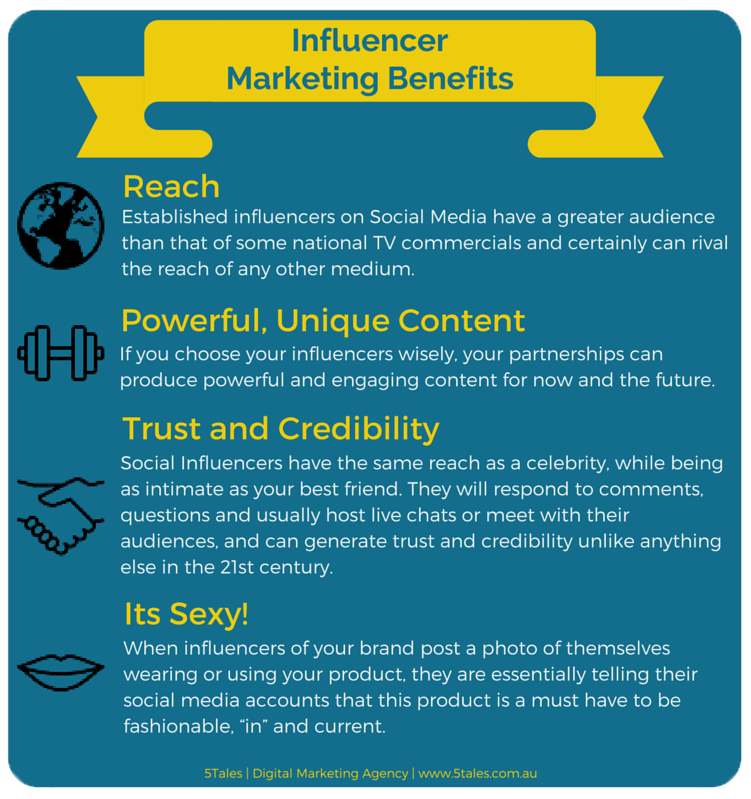 A benefit of influencer marketing is that it can be leveraged by both B2B and B2C (business to business or business to consumer) across a number of different industries. Generally it can be leveraged most effectively in product or brand launches as well as long term sponsorship strategies. Think LeBron James for example – in 2014 alone, Nike sold over 340 million dollars worth of his bespoke basketball shoes with no groundbreaking technology or different attributes to the other shoes, but simply by wearing and promoting these shoes to his audience, sales were higher than any other – due to his influence on basketball fans, Nike’s select target market in this particular instance. An influencer can be Justin Bieber, Taylor Swift or David Beckham, but influencer marketing can also be just as effective if everyday fans of your brand or “Brand Ambassadors” are contacted and made partners of your brand.Not only are these people more in reach of your company, but with them you can build genuine and trustworthy relationships with your target market. Social media isn’t just an alternative to traditional forms of media – it’s legitimately turning the original model on its head. Rather than making purchasing decisions based on what they see on TV, people are now spending their time on social media and looking to make purchase decisions based on what they have learnt about their experiences with a particular product or service. The focus is now on brands talking WITH their consumers rather than AT them. In this paradigm shift, brands are no longer expected to sell to them, but to entertain, inform and engage them. This is not a short term media buy, relationships over transactions, authenticity over sales and acute targeting over broad reach. Your relationship with the influencer is key, if they like and trust your brand, their content will follow and achieve greater returns. Let them shape and influence the audience based on your brand guidelines – they will know their followers better than you do. Choose the right influencers – choose on fit, audience demographics and engagement with your target audience, focus on growth rather than reach. Make your subject line straightforward and interesting. Think of it as a landing page headline or a marketing email subject line, where you’re marketing your partnership to influencers. The influencer won’t know you, start off by introducing yourself and your company/brand. Then tell them why you’re reaching out and what your goals are. Follow this with an explanation of why you consider them a good match for your campaign. Give them a reason to work with you by telling them about the incentives and the benefits involved. Don’t assume they’ll work with you. Be sure to frame your sentences in such a way that you’re offering a proposal, which they have the freedom to reject. The bottom line is, by implementing an influencer marketing campaign your business has the opportunity to build brand equity, spread the word about your product and target it specifically to your audience. Try out different methods with multiple influencers, evolve with them and make sure you always relate back to your original business goals.